How far in advance should I book my Rebound Birthday party? To help ensure that your party is booked in for your ideal timeslot on your child’s special day we suggest that you make a booking at least 4-6 weeks out. What are the minimum numbers required? There is no minimum number as such, but parties are priced as a minimum for a booking of ten and any additional guests are charged at the per person rate applicable to your package. We have a small group but dont want to book a party , can we just bring in some food and cake and have that in the cafe? Unfortunately no, we dont allow outside food or cake in the cafe as we have limited space in the cafe area and cannot accommodate inpromptu partys in this space. you can however dry hire a party room for after the jump session ( subject to availability) for such an event or group where you can bring some food and have cake. please contact us via email or phone to get those details or secure a room booking. To book your child’s birthday party, we require a deposit of 50% with the remaining balance being paid one week prior to your booking, or on the day of the party. No refunds are applicable after this time. Can I add extra guests after I make my booking? Yes. If you would like to add additional guests please contact our friendly party team. Please note that if we have passed our capacity for that time period we will not be able to add any additional guests. How long does a Rebound party go for? All parties run for 2 hours. 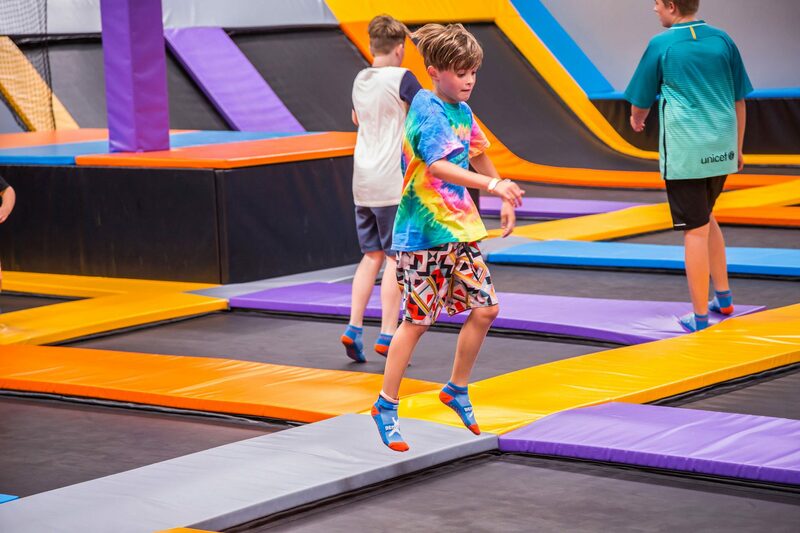 This starts with check in 15 minutes prior to the session start then 1 hour of hosted fun and activities including some free play to explore our trampolines and climbing wall. The last 45min of your booking we gather up all party goers to enjoy food and birthday cake in your designated party room. Can I decorate the room with balloons etc for the party ? How long before the birthday party should I arrive? We suggest that parents invite all guests to arrive at Rebound 15 minutes before the start of their party to ensure all children get maximum playing time. This ensures the guests are all ready to go when the hour session starts. Is there a minimum age to have a Party at Rebound? Although we have an age limit of 3, and we accommodate junior jumpers ( over 3 and under 110cm) during the first two sessions of the day, the ideal age for a party in our opinion is 5 and up. Unfortunately toddlers would not be able to participate on most of our equipment for their own safety and we would hate to disappoint anyone with a boring party. Note that we also have a 125cmm height restriction on some zones in our arena. We apologise for any disappointment but when they are old enough and tall enough, we look forward to seeing you and delivering an awesome experience for their birthday. When is the best time for my group ? We recomend that the younger ones attend the morning party time slot or the later afternoon time slot as it gets very busy in the middle of the day and the morning sessions are generally a bit quieter. What does your party host help with? Your party host is there to make sure the experience is as smooth and care free for you as possible. The party host will greet you and your guests 15 minutes before your session starts, providing each party guest with wrist bands and socks. After introducing guests to the park, your party will have access to the trampoline areas for approximately 60 minutes. At the end of the 60 minutes, the party host will call the guests back to the room for party food and to ‘do the cake’. Finally, after you’re finished with the private room, they clean up the mess for you! Please note: Your party host may not stay with the group the entire time they are playing in the park. We find some parties prefer structure, and some parties prefer freedom. If you would like a party host for the entire duration of the party, please ensure you notify our staff at least 7 days in advance of your booking. Our Café can cater for most dietary requirements, please let our party team know of any special requirement when making your booking. Yes , with a self catered Party package you can! You get all the same benefits of a party package , but you supply the food. However we are unable provide any reheating or refrigeration facilities with this option ( except for the birthday cake ) All party package bookings can bring along a Birthday cake ! What can adults do while the kids are jumping? You can actively watch and encourage your children/guest during their party. Join in on some of the fun or simply relax at our Café with coffee and cake. What Food/beverages do you serve? We like to offer a range of menu options from healthy choices to the traditional party type of snacks.